Having just finished my latest novel, ‘Time of Flight’, which is set in 1931, and features - amongst other characters - a number of female flyers, I wanted to make my last post for the History Girls about these wonderful ‘queens of the air’, who did so much to popularise flying in its golden years. 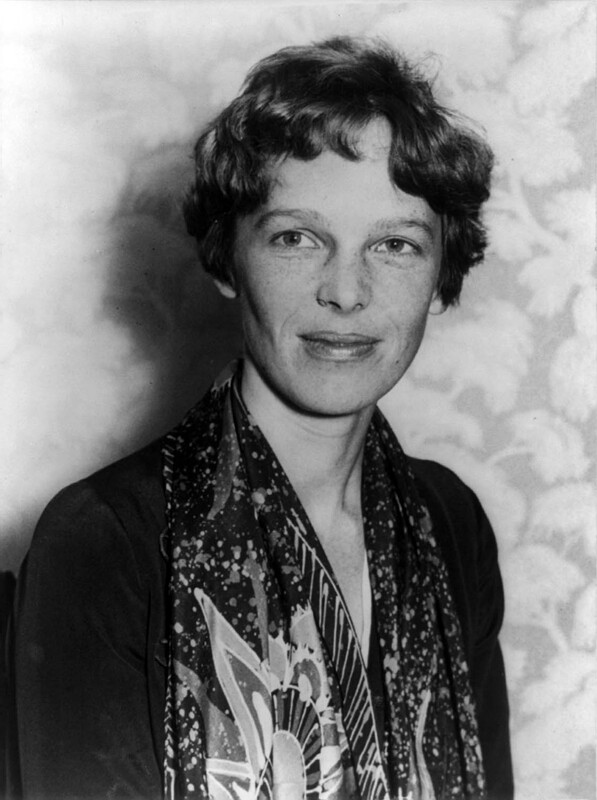 One of the most celebrated was Amelia Earhart - pronounced ‘Air-heart’ (1897-1937) - who, apart from setting numerous aviation records, including being the first female aviator to fly solo across the Atlantic, was instrumental in setting up ‘The Ninety-Nines’, an association of women pilots. 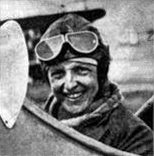 In 1920, Amelia visited an airfield at Long Beach, paying $10 for a 10 minute flight in an aeroplane piloted by Frank Hawks. This proved a turning-point for the young enthusiast: ‘By the time I had got two or three hundred feet off the ground,’ she said. ‘I knew I had to fly.’ Like Amy Johnson after her, she saved up for flying lessons and had her first lesson a year later, gaining her pilot’s license in 1923. Her instructor was the delightfully named Neta Snook (1896 - 1991), who ran a commercial flying school in Virginia (the first woman to do so), and who later wrote about her friendship with Earhart in her book, I Taught Amelia to Fly. 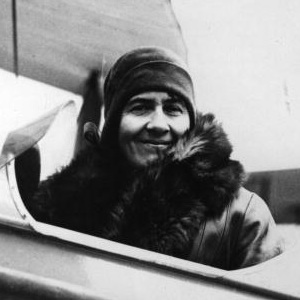 In May 1932, having undertaken many lengthy flights across America, she got her wish. Setting off from Newfoundland, she arrived, 14 hours and 56 minutes later, in what she hoped was Paris. In fact, it was a field in Ireland - her Lockheed Vega 5B aeroplane having been blown off course. 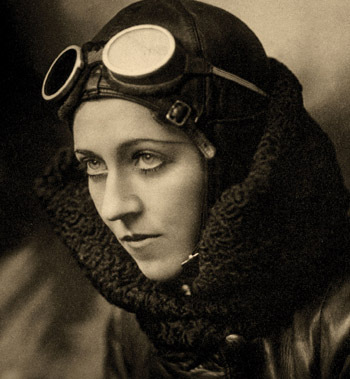 But she’d done it - becoming the first woman to fly solo across the Atlantic. Awards and acclaim followed, but Amelia refused to rest on her laurels. She was determined to fulfil her dream of flying around the world, and, after several false starts, set off in July 1937 with co-pilot Fred Noonan, in her Lockheed Electra 10E. What followed has been the subject of speculation ever since, after the aeroplane disappeared over the Pacific. Was it sabotage, engine failure, or (the most likely scenario) a breakdown of the inflight radio system which caused her to lose her way? Amy Johnson (1903 - 1941) was Britain’s ‘answer’ to the woman nicknamed ‘Lady Lindy’ by the American press, and became a close friend of her ‘rival’, several years before Earhart’s untimely death. Born, the daughter of a prosperous businessman, in Kingston upon Hull, Amy went first to university to read Economics, then got a job as secretary to the solicitor William Charles Crocker. My grandfather Charles Thompson - the model for my ‘Blind Detective’, Frederick Rowlands, in the series of novels of which ‘Time of Flight’ is the latest - worked as a receptionist in the same office, and knew Amy when she was first getting interested in flying. (It’s one of the reasons I knew this book had to have an aviation theme.) This was in 1928; a year later, after saving up and paying for flying lessons at £2 an hour, she gained her pilot’s license, and later the same year became the first woman to gain a ground engineer’s ‘C’ license - a qualification that would stand her in good stead on her record-breaking flight. 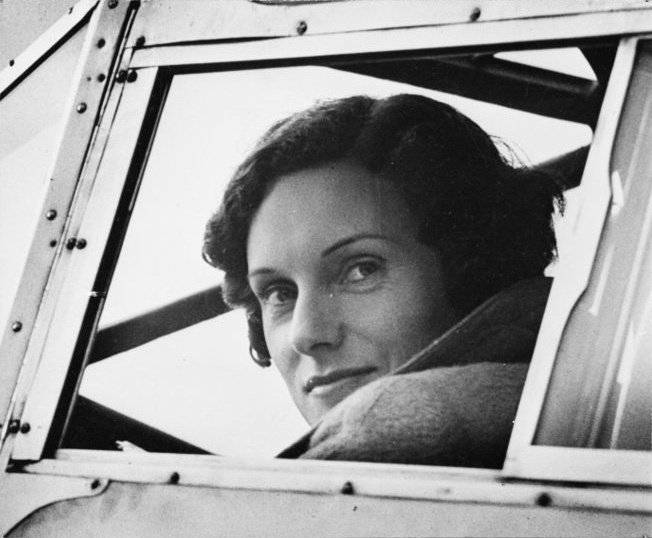 This was the first solo flight by a woman from England to Australia. Amy was twenty-six years old, and had had only 90 hours’ flying experience when she set out from Croydon Airport on May 5th, 1930 in her De Havilland GH60 Gipsy Moth ‘Jason’, on the first leg of her 11,000 mile journey. 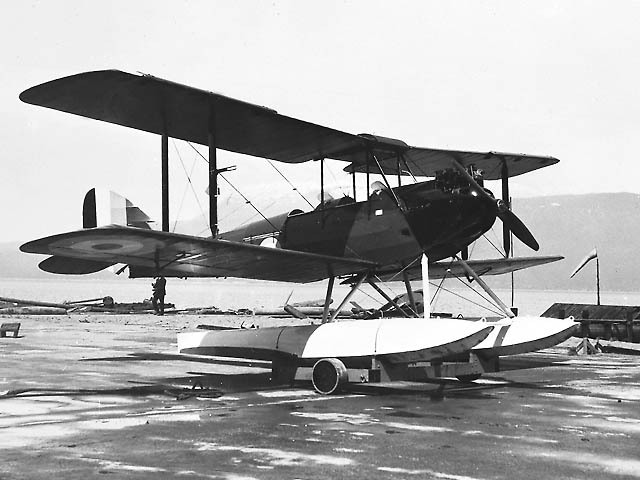 During the course of this epic flight, she averaged 800 - 900 miles a day, battling through rainstorms and fog, and on one occasion was forced to land in the Egyptian desert, on account of a sand-storm. Much of the time she was ‘flying blind’, unsure of her direction - radar had yet to be discovered and the instruments she had to guide her were rudimentary. She was therefore obliged to find her way by the simple expedient of looking down from the open cockpit, and following the lines of rivers and roads. Reaching India in a record six days, she ran into the monsoon, which reduced visibility to zero, and forced her to crash-land. Her engineering skills enabled her to fix the damaged plane, and she took off again for Singapore, sometimes flying so low over the sea that she was skimming the tops of the waves. After yet more hair-raising escapades, she reached Darwin on May 24th - to an ecstatic reception. ‘Amy, Wonderful Amy’ became one the hit songs of 1930; lucrative contracts with the Daily Mail (which had sponsored the flight) followed. ‘The Flying Typist’ became an instant celebrity - a role with which she was far from comfortable. 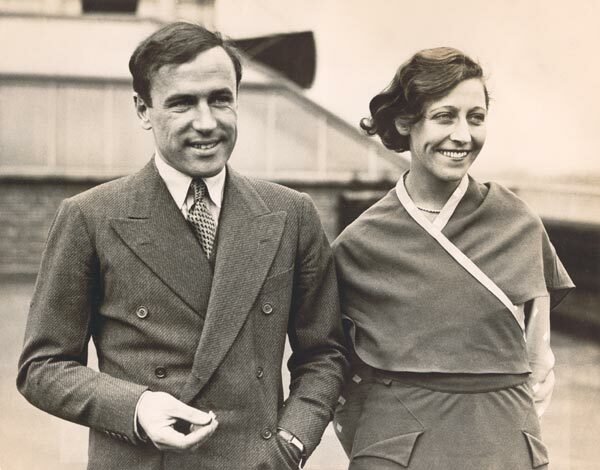 Her passion was flying, and she continued to set records throughout the 1930s, including one for a solo flight from London to Cape Town in 1932, breaking her husband Jim Mollison’s record, set the previous year. Billed as ‘The Flying Sweethearts’ - the press then being as fond of a sentimental headline as they are today - she and Mollison made several long-distance flights together, including one to New York which ended in a near-fatal crash. After the marriage ended, Amy continued to pursue her fascination with speed, taking up rally driving and gliding, and becoming a part of what was then known as the ‘Smart Set’. 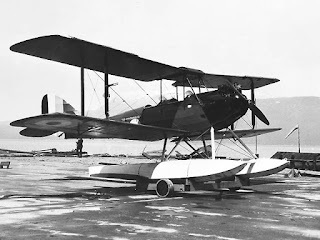 I haven’t space to give more than a brief mention to a few of the other distinguished aviatrices of the 1920s and 1930s, whose exploits were no less daring and ground-breaking than those already described. 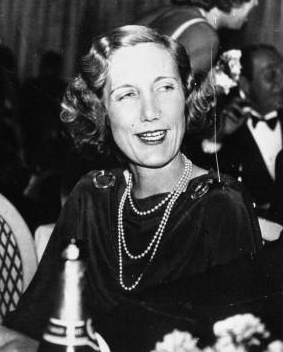 Beryl Markham (1902- 1986) is one of these - the first woman to fly solo across the Atlantic from East to West, a journey she wrote about in her 1942 memoir, ‘West with the Night’, whose style was much admired by Ernest Hemingway (not a man given to praising other writers). 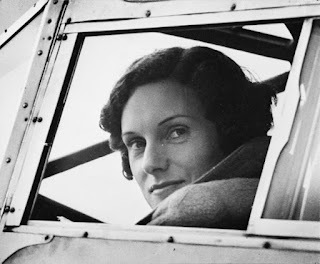 Glamorous and headstrong, Beryl was renowned not only for her flying skills but also for her many love affairs - including one with Denys Finch Hatton, the husband of her friend, the writer Karen Blixen, and a member of the notorious ‘Happy Valley' set. 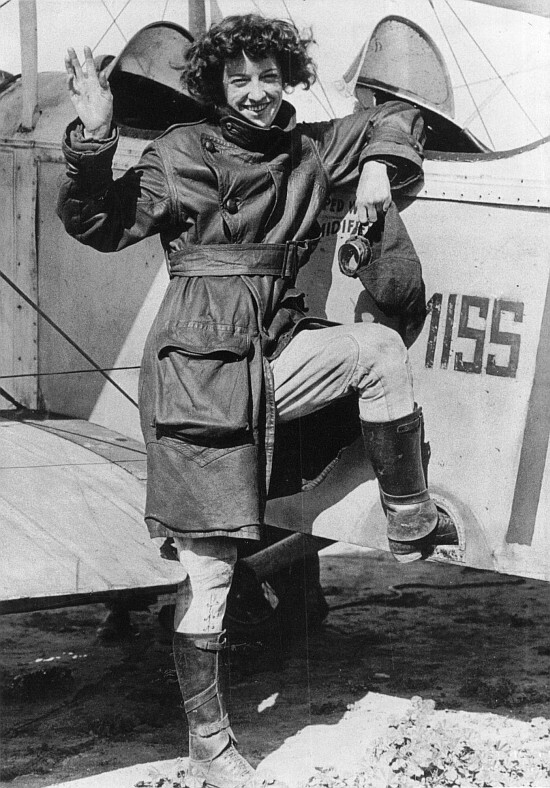 Other celebrated female pilots of the era include two flying aristocrats - both, rather confusingly, with the same first name. Born in County Limerick, Lady Mary Heath (1896 - 1939) began her adventurous career as a dispatch rider during the First World War. In 1928, she became the first woman to fly from London to the Cape - a journey which took her three months. Lady Heath liked to travel in her pearls and fur coat - no doubt a sensible precaution, in those days of open cockpits. 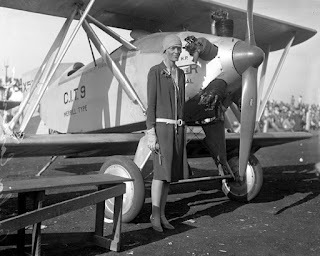 Her extraordinary feat was matched by another Irish aviatrix, Lady Mary Bailey (1890 - 1960), the daughter of the fifth Baron Rossmore, whose 18,000 mile journey across Africa was the longest solo flight ever attempted by a woman. She was modest about her difficult and dangerous achievement, saying in an interview with The Times that she’d been ‘just flying about’, and breaking her journey back to Croydon Airport with a stop-over at the Ritz Hotel in Paris, because, she said, she badly needed a bath! I could go on - but I’ve run out of space and time. So I’d just like to say, ‘Thanks for having me,’ to all my fellow history girls. May your ‘flights’, literary and otherwise, all have safe landings. Over and out! Great post, but what about Bessie Coleman? :-) First African American aviatrix, who lived around this time - maybe even the first African American flyer altogether? And she inspired her nephew to take to the air. She is still celebrated. Thanks Sue - sadly, there were a lot of women I had to leave out, for space reasons! Glad you enjoyed the post, Joan! You seem to have a spam comment here. See "Andrew". IT WORKED FOR ME! IT WORKED FOR ME!! IT WORKED FOR ME!!! Am Veths want to share my testimony on how my husband came back home. My husband left home for two year after we got we hard a query I was looking for help who to get my husband back to me, I told my friend about my problem she told me that there is is a good spell cater who can help me get my husband back to me she take me there and I told the man about my problem and he said he is going to help me get him back I was thinking. He was joking he side I should go and in three days my husband will come back home to me. I was waiting on that day for my husband is going to come back home on that same day I was sleeping when my husband call me and told me is out side the house and I was very happy for what the great spell caster did I want you to help me thanks Dr AJaguna if you are in same problem of getting back your ex husband contact him. Please I know you will need his help contact him he can help you I believe in him and is help very much he is a great man. i never believed that i could finally get back the happiness and the love that was gone after my husband left me totally. I couldn't just believe that spells and magic could turn my thoughts and my dreams into reality in getting back with my husband after he served me with divorce papers.. my ex husband after the divorce never showed up to me and the kids anymore, he finally made up his mind on me and said it was over. 2 years after our divorce, i was still out trying to get him back and i did all that i knew best could make him happy, and my mum and everybody around just advised i should forget about him and move on with my life, because they felt he was gone forever and was never gonna return. But i never gave up on trying to get him back, because i so much loved him beyond what anybody could ever imagine. I met a spell caster, and what drew my attention most was the fact that this spell caster was presently here in Florida when i contacted him. And that so much gave me the assurance because i have heard much more on how he has helped a lot of people... and with the help that this spell caster rendered to me, he saved my marriage and reunited me and my ex husband back together again with his powerful spells. this are the spell he cast if you have problem contact him to solve these issue below. my name is Tina from Canada, I want the world to know a great man that is well known as Dr.UZOYA, he has the perfect solution to relationship issues and marriage problems. The main reason why i went to Dr UZOYA was for solution on how i can get my husband back because in recent times i have read some testimonies on the internet which some people has written about Dr UZOYA and i was so pleased and i decided to seek for assistance from him on his email [driraborspellcaster@gmail.com] which he did a perfect job by casting a spell on my husband which made him to come back to me and beg for forgiveness.I will not stop publishing his name on the net because of the good work he is doing. I will drop his contact for the usefulness of those that needs his help should contact him via email [driraborspellcaster@gmail.com ] You can contact him today and get your problem solved. his telephone number is +13019098775..
he specialized any of those problems.